Wear a red heel to add a pop of colour to a monotone outfit. Nicole Richie is famously known for her oversized shades and boho style but ive noticed how it has gone unknown how well that she wears the red heel. Nicole adds a red pair of heels to a monotone outfit to add a ping of colour and make the outfit more edgy. This looks easy to pull off and it is but you must find the right red shoe. Cheap red shoes look cheap so don't spare on the cash. Opt for a patent high heel to make the most of the look. 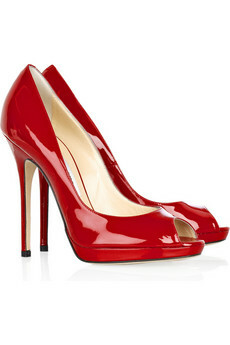 My favourite red heels are these Jimmy Choo patent peep toe's.